Handsome tree, to 100 feet, branches yellow-brown, buds enclosed by large imbricate scales; leaves alternate, ovate-elliptic, to 5 inches long, acuminate, whitish beneath, shed in early spring and immediately replaced by new leaves; panicles shorter than leaves; flowers yellow; fruit globose, black. Thrives in southern California and in southermost US states; useful as a specimen tree for parks or for row plantings along streets. The wood is much used in cabinetwork in the orient; twigs, leaves and wood distilled to produce camphor. 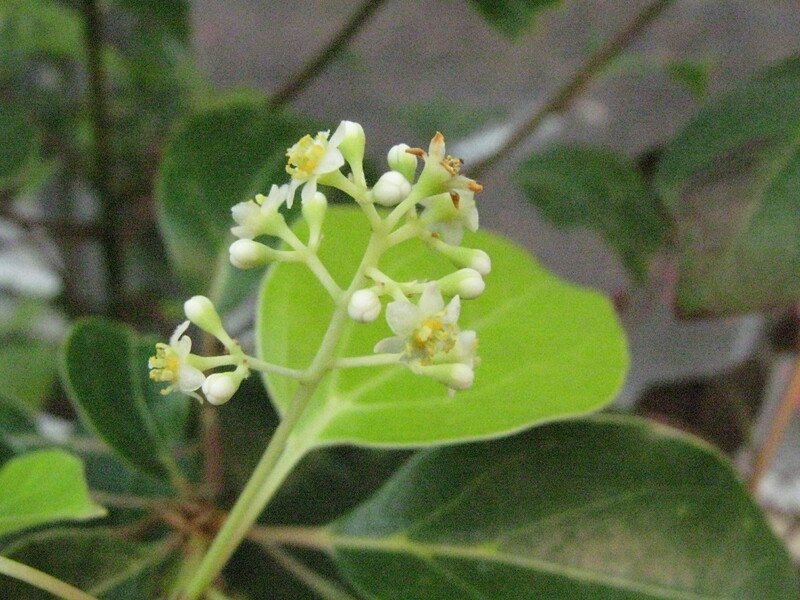 This plant is listed as a Category 1 plant by the Florida Exotic Pest Plant Council as it is quite invasive and disruptive of native plant communities. An eradication effort is underway in many areas of Florida. 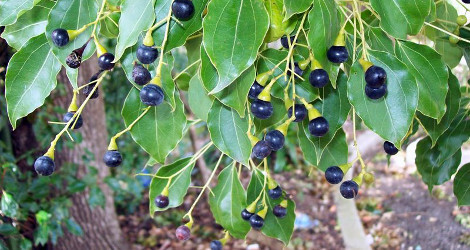 Uses: Camphor oil has a strong penetrating fragrance, a pungent bitter flavor, and feels cool on the skin like menthol, though it also has irritating qualities as well as a numbing effect. 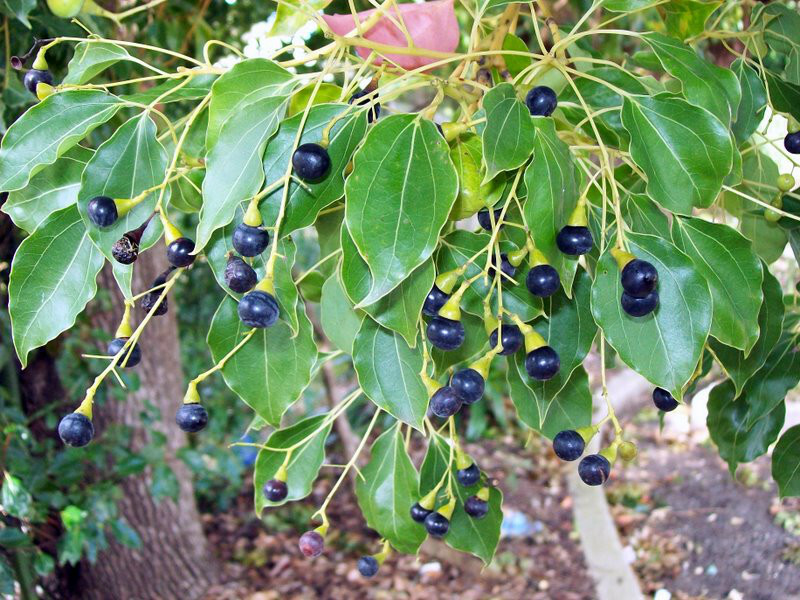 Camphor has been used to treat ailments ranging from parasitic infections to toothaches. Scientific evidence has confirmed that chemicals in the plant have value in antiseptics and medications for treating diarrhea, inflammation, itching, and nervous conditions. Known in traditional Chinese medicine as Gui Zhi. Voucher 129183 at George Safford Torrey Herbarium (CONN). Specimen collected 17 February 2005. Herbarium Image. Image #00 & #02 by Poyt448 Peter Woodard (Own work) [CC0], via Wikimedia Commons. Last accessed on Thursday, December 07, 2017. The Plant List (2013). 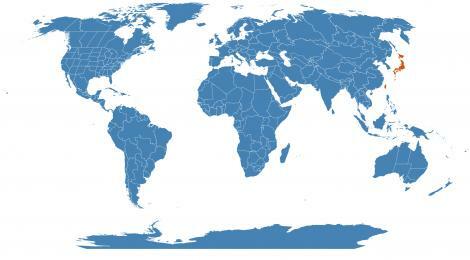 Version 1.1. Last accessed on Thursday, December 07, 2017. 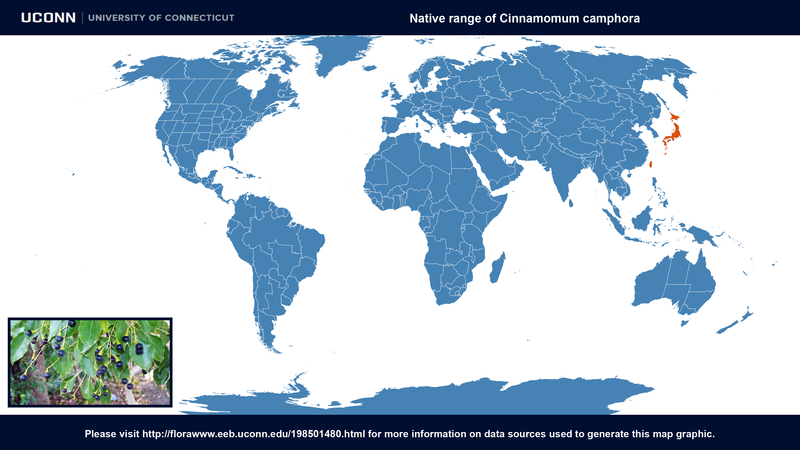 Cinnamomum camphora at ARS-GRIN. Last accessed on Thursday, December 07, 2017.